Social Justice and Empowerment, Shri Thaawarchand Gehlot launched an exclusive job portal for Persons with Disabilities (PwDs) here today. The PwDs can avail the different facilities such as self employment loan, education loan, skill training, link to scholarships and information about jobs in a single window platform through this National Job Portal. Ministers of State for Social Justice and Empowerment Shri Krishan Pal Gurjar and Shri Vijay Sampla were also graced the occasion. Launching the portal, Shri Thaawarchand Gehlot said the Government has given very high priority to skill training programme for Persons with Disabilities and has a target for skilling five lakh persons in next 3 years. The skill training will be provided by a network of 200 clusters of “Training Partners’ with financial assistance of government. A time bound action plan has been prepared for this purpose, the Government will also pursue private sector for providing them job after the training, he said. Highlighting the other initiatives of his Ministries Shri Gehlot said assistance for education and medical treatment has been given big thrust by his Government. Recently a scheme has been launched to plant an especial device for assistance to deaf and dumb children. So far within one and half month 305 children have been provided this device. Encouraging results have been seen and many of these children are now able to speak and hear like normal children. The Minister also said that the Government is also working on universal ID programme for persons with disabilities so that they can get facilities across the country on the production of the ID. Department of Empowerment of Persons with Disabilities, Ministry of Social Justice and Empowerment, Govt. of India has entrusted National Handicapped Finance and Development Corporation (NHFDC) to develop a National level Job portal for the persons with disabilities (PwDs). A disabled-friendly National level Job portal, www.disabilityjobs.gov.in, will a long way for empowering persons with disabilities by providing them all desired information for employment opportunities at one platform. On the occasion, a book on success stories of 100 PwD entrepreneurs who have come up in their life to be the true role models will be launched. The book “YES WE CAN” has been published by penguin publishers with the support of NHFDC. 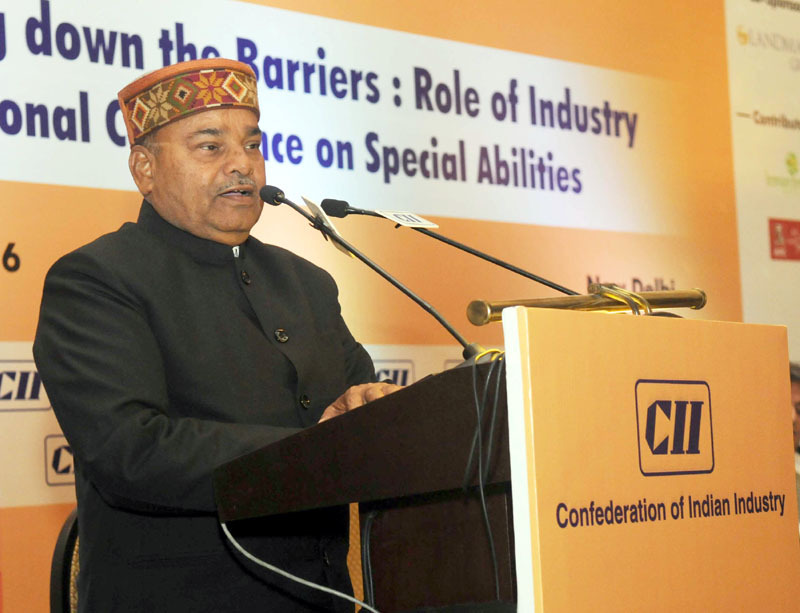 While the government has recently launched several initiatives like Accessible India Campaign, the public and private sector should come together to ensure inclusion and mainstreaming of differently abled, said Shri Thaawarchand Gehlot, Minister for Social Justice and Empowerment. Speaking at the special session of the National Conference on “Special Abilities- Breaking down the Barriers: Role of Industry”, organized by the Confederation of Indian Industry (CII) here today, the Minister urged industry to come forward and map and upgrade skills of Persons with Disabilities (PwDs). He asked the industry to support government initiatives and especially look at providing assistive devices and medical assistance for PwDs. Lov Verma, Secretary, Ministry of Social Justice and Empowerment, Department of Empowerment of Persons with Disabilities, Government of India, suggested that industry creates an action plan with timelines and targets, towards inclusion. Mukesh Jain, Joint Secretary, Ministry of Social Justice and Empowerment, Department of Empowerment of Persons with Disabilities, Government of India, shared the three pillars of the Government’s Accessible India Campaign- Accessibility of Built environment, transport and technology. Responding to the apprehensions, Mr Jain clarified that the Accessibility index, which is almost finalized, is an aspirational and educational benchmark and not a mechanism to penalize companies. The index will celebrate and recognize companies who have championed the cause of inclusion. The National Conference was held with the objective of creating a momentum within the corporate sector towards building inclusive workplaces. The discussions were focused on effectively addressing barriers, sharing experiences, good practices and the business case for including PwDs in organizations,. Speaking at the conference, Mr Patu Keswani, Chairman, CII National Committee on Special Abilities and that hiring PwDs is not a matter of charity. The advantages, he said, range from increased productivity, reduced attrition rate, reduced absenteeism and a brand image of being an inclusive enterprise with positive spin-off for all stakeholders. Creating inclusive workplace should be a top-down approach with dedicated resources to ensure inclusion. It is important that the top leadership of the company believes in mainstreaming PwDs and roll out sensitization programs to break myths, he added. The Conference saw the release of DIY booklet on Inclusion- Breaking down the Barriers, developed by CII, which is a practical guide that offers simple and easy steps for enabling inclusion of PwD in Corporate Sector. The booklet has been developed by the practitioners and experts on inclusion and accessibility from the industry who have applied them at their workplaces. Some of the good practices in leading organizations were shared by senior industry leaders. The CEO’s shared the key ingredients for successful inclusion and mainstreaming of PwDs- passionate leadership to bring convection, vision that permeates through organization, training and sensitization of other employees, developing and encouraging a peer group for employees with special abilities and mapping a career path for each employee irrespective of their disabilities. The conference was attended by Government and corporate sector representatives, NGOs, and inclusion, diversity and technology experts.